the ground is water. the 1989 feet tall turtle is on the ground. the turtle is shiny. 9000 foot long prickly pear cactus on the turtle. green light above the prickly pear cactus. a huge ghost white light. the ambient light is silver. the prickly pear cactus is 15% transparent. clear ground. white sky. a 400 inch tall white pipe is 400 inch above the ground. a 500 inch wide glass sphere is -130 inch above the pipe. the glass sphere is -370 inch left of the pipe. 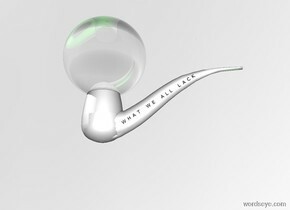 [W H A T W E A L L L A C K] is black. it is 465 inch above the ground and in front of the pipe. it leans 32 degrees to the right. 3 green lights are behind the sphere. An octopus is on top of a big orange ball. A man is a foot in front of the octopus. The man is 3 feet in the ground. A cow is 12 feet behind the octopus. The cow is 5 feet in the air. The cow is upside down. A man is five feet in the ground. A big rainbow horse is 15 feet behind the man. A hat is 6 inches above the horse. A cow is 2 feet to the right from the horse. The cow is 5 feet behind the horse. The cow is 2 feet above the ground. The cow is upside down. A very large red ball is 3 feet behind the man. The ball is 6 inches to the left from the man. The ball is a foot above the ground. 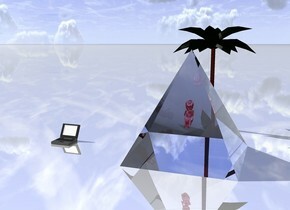 The Computer is on top of the pedestal.The ground is pink. There is a green light above the computer. 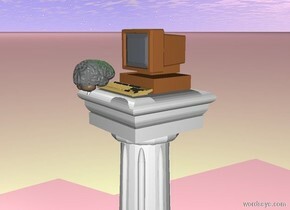 The brain is in front of the computer. The brain is facing the computer. My boots are in my luggage and they are made for kicking..
one small woman is on a map ground. 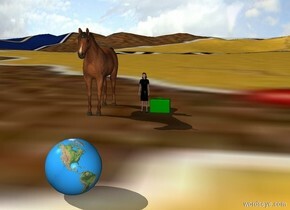 a horse is 2 foot to left of woman. a small green suitcase on right of woman. the ground is a map. 13 feet in front of woman is a globe. 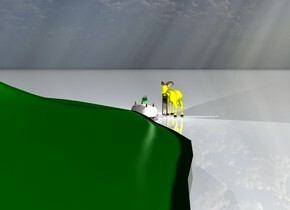 A green shiny duck is below an upside down tub. The duck is 10 inches into the tub. The sky is shiny. The ground is shiny. A mirror is 2 feet left of the tub. 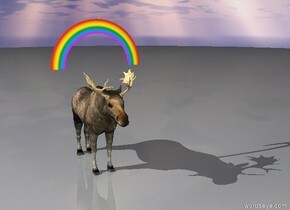 A rainbow light is 1 foot left of the duck. the mirror is facing left. The tea kettle is on top of the duck. A yellow goat is over by the bathtub. A mountain sits 30 meters from the bathtub. the phone on the shiny ground. 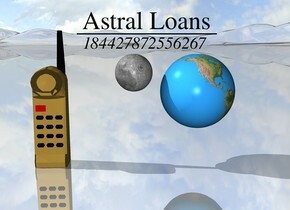 the extremely small earth is to the right of the phone . the earth is 5 inches away from the phone. the earth is 2 inches above the ground. the extremely small moon is next to the earth. the moon is 4 inches above the ground. the moon is 1 centimeters away from the earth. There is a translucent couch. There is a shiny gold large wall three feet away behind the couch. The ground is shiny gold. There is a large translucent plant 1 feet left of the couch. 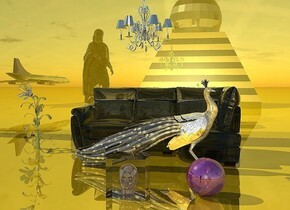 There is a shiny orange peacock on the ground in front of the couch. There is a translucent cube 2 feet in front of the peacock. 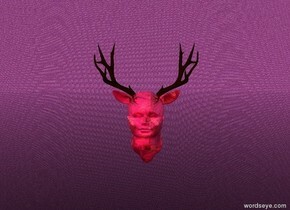 There is a shiny pink head 12 inches inside the cube. There is a silver chandelier 1 feet above the peacock. There is a shiny purple sphere 1 feet to the right of the cube. The peacock is facing east. There is a shiny small building 15 feet in front of the sphere. There is a 12 feet tall translucent statue 3 feet to the left of the building. The statue is facing the cube. There is a tiny translucent airplane next to the statue. The airplane is 3 feet above the ground. Must go to the dentist. 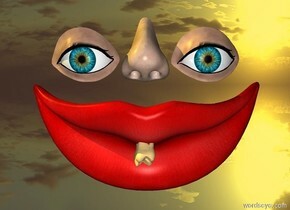 a 15 feet tall mouth.the mouth is 10 feet above the ground.a 10 feet tall nose is above the mouth.a 8 feet tall eye is 3 inches left of the nose.a second 8 feet tall eye is 3 inches right of the nose.a 5 feet tall molar is -60 inches in front of the mouth.the molar is upside down.the molar is leaning 45 degrees to the back.the molar is -98 inches beneath the mouth.the ground is silver.the sun is lemon. A woman. 10 shiny women 10 feet in front of the woman. The women are pink. The sky is gold. A big silver cube 15 feet in front of the woman. The cube is 100 feet tall. The cube is 100 feet wide. A big silver cube 5 feet behind the woman. The cube is 100 feet tall. The cube is 100 feet wide. The ground is transparent. The ground is shiny. 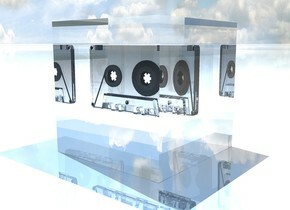 The cubes are reflective. 12 huge shiny brains in front of the woman. The brains are 10 feet above the ground. The woman is white. The woman is shiny. A pink light above the woman. A blue light above the women. A red small couch. A giant pink [putin] bunny is facing the couch. The couch is facing the bunny. The ground is [putin]. 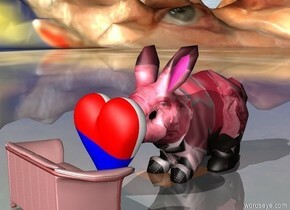 A [flag] heart is on the left of the bunny. The heart is facing the couch. One enormous red eye is facing up. The eye is 3 feet in a big fish bowl. The eye is -2.6 feet in front of the fish bowl. A tiny red mat is in front of the fish bowl. The red mat is on the ground. White "ICUP" is on the mat. 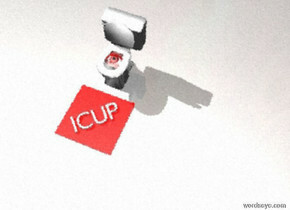 "ICUP" is facing up. the ground is [space]. the sky is [stars]. the sun is navy. there is a brain. 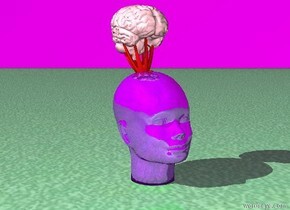 the brain is 0.25 inches inside a head. 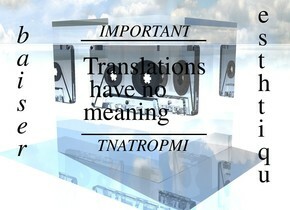 a large translucent spider is -6 inches to the right of the brain. 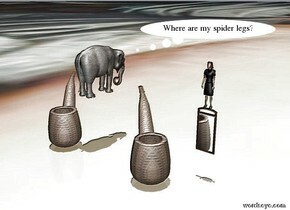 the spider is inside the brain. 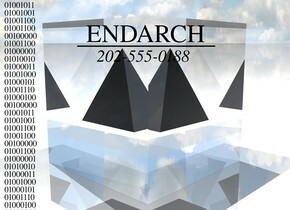 there is a clear pyramid 6 feet behind the head. the pyramid is 10 feet to the left of the head. there is a clear dodecahedron 2 feet behind the head. there is a clear sphere 2 feet to the left of the head. 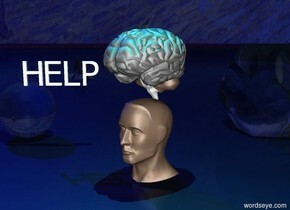 a very very small "HELP" is 1 foot to the left of the head. "HELP" is 1 foot above the ground. "HELP" is facing southeast.. 5 feet above the head is a cyan light. The big elephant is standing on two 40 feet long wooden pipes. The pipes are facing southwest. The ground is a mirror. It is noon. A big lady is 20 feet above the ground. The lady is facing north. A huge mirror is below the lady. 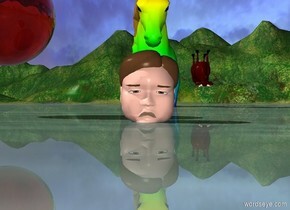 There is glass head. There is an tiny tulip red octopus 1.5 inches in the head. 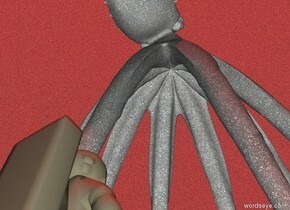 The tiny octopus is leaning 200 degrees to the back. The octopus is -5 inches to the back of the head. The pink small Brain is 4 inches in the octopus. The sky is fuchsia. The ground is glass. 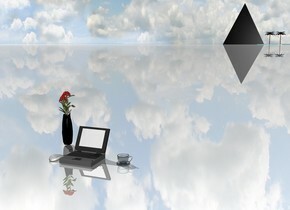 there is a reflective silver cube on a glass floor. it is night. there is a spotlight on the reflective silver cube. the spotlight is reflective gold. the reflective white light is two feet above the spotlight. the reflective white light is two inches in front of the spotlight. there is a very bright purple transparent skull one foot in front of the spotlight. the very bright purple transparent skull is facing the spotlight. the very bright red light is one inch below the very bright purple transparent skull. the very bright red light is facing the very bright purple transparent skull. there is a purple light one foot above the very bright purple transparent skull. the purple light is facing the very bright purple transparent skull. there is a very small transparent silver ufo two inches above the very bright purple transparent skull. 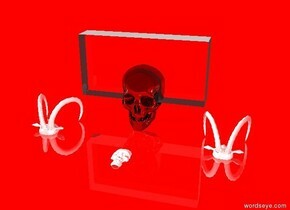 there are nine very large very reflective very bright red crystals under the very bright purple transparent skull. the very large very reflective very bright red crystals are six inches in front of the very bright purple transparent skull. 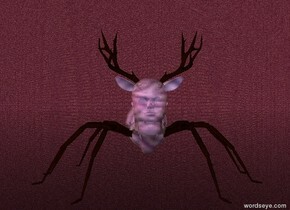 there is a spiked collar one inch below the very bright purple transparent skull. the spiked collar is facing up. The Astronaut is pepper gray. The head of the Astronaut is pepper gray. The backpack of the Astronaut is pepper gray. The ground is silver. Octopus behind Enormous asphalt octopus behind astronaut. It is noon. The sky is asphalt. The camera light is white. The sun is red. 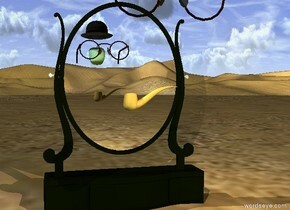 a pipe is a foot in front of the mirror. it is 1.5 feet above the ground. the hat is 1.5 feet in front of the pipe. it is 3 feet above the ground. the celadon green apple is 2 inches below the hat. the big pair of eyeglasses are behind the apple. they are facing back. the gold light is behind the glasses. the sun is summer rain blue. the baby pink light is in front of the pipe. the camera light is sea mist blue. the big hat is upside down. it is 3 inches above the narrow table. 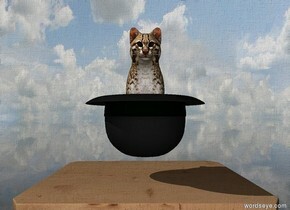 the small cat is -2.7 inches in the hat. the ground is transparent. the clear sphere is 20 feet wide. the huge white illuminator is in the sphere. the 20 feet wide clear cube is to the left of the sphere. 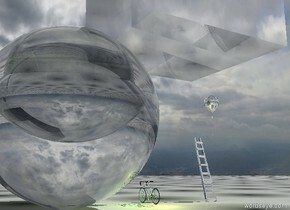 the silver bicycle is next to the sphere. the big silver balloon is 9 feet to the left of the bicycle. it is 13 feet above the ground. the silver ladder is under the balloon. 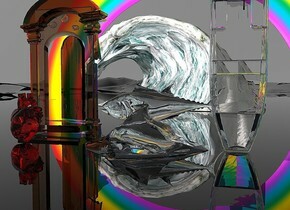 the white illuminator is under the cube. the yellow illuminator is next to the sphere. the green illuminator is next to the ladder. the ground is 10 feet wide pattern. the sky is a photo. the first clear sphere is 20 feet wide. the second clear sphere is 15 feet wide. it is 20 feet inside the first sphere. the third clear sphere is 10 feet wide. it is 7 feet inside the second sphere. the huge white illuminator is in the sphere. the 20 feet wide clear cube is to the left of the sphere. 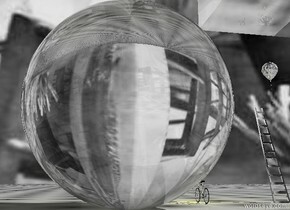 the silver bicycle is next to the first sphere. the big silver balloon is 9 feet to the left of the bicycle. it is 9 feet above the ground. the silver ladder is under the balloon. the white illuminator is under the cube. the yellow illuminator is next to the first sphere. 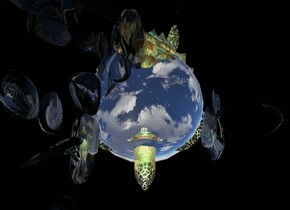 the green illuminator is next to the second sphere. the ground is 20 feet wide pattern. the first transparent sphere is 20 feet wide. the second transparent sphere is 15 feet wide. it is 20 feet inside the first sphere. 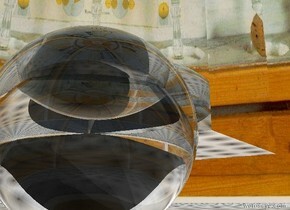 the third transparent sphere is 10 feet wide. it is 5 feet inside the second sphere. the huge white illuminator is in the sphere. 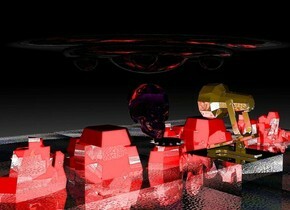 the 20 feet wide silver cube is to the left of the sphere. the big white illuminator is under the cube. the ground is pattern. the sky is photograph. The ground is shiny black. The sky is [electric]. The camera light is yellow green. It is dawn. The pink chinchilla is 30 feet tall. The shiny [electric] wall is 60 feet behind the chinchilla. It is 80 feet tall. It is 1000 feet wide. The shiny yellow computer is 30 feet right of the chinchilla. It is 40 feet tall. The black sphere is 14 feet right of the chinchilla. It is 2 feet wide. The shiny shoe is 50 feet above the sphere. It is white. it is 50 feet tall. It is facing right. The red light is in front of the shoe. The green light is above the shoe. The white light is 15 feet right of the chinchilla. It is 50 feet above the ground. The hand is 80 feet in front of the sphere. It is 60 feet tall. It is 10 feet in the ground. it is shiny white. "What's" is 10 feet left of the chinchilla. It is 15 feet tall. "Up????" Is 10 feet right of the computer. It is 15 feet tall. 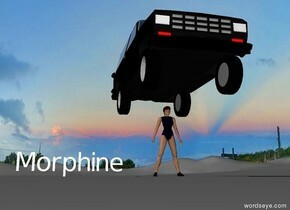 There is a black car above a woman wearing "Morphine". the tiny tiger is on the rembrandt pizza box. 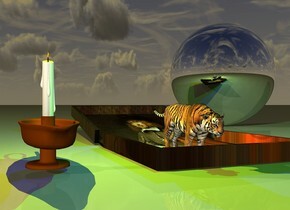 a large candle is a foot left of the tiger. it is facing left. it is dusk. a yellow light is above the candle. a green light is a foot above the tiger. A very large silver sphere is behind the box. it is a foot right of the box. a blue light is above the box. 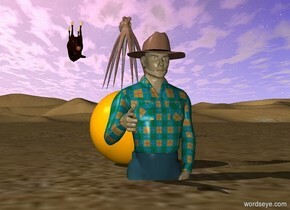 The transparent sphere is in the giant hand. The very large orange light is 1 foot above the ground. it is 10 foot behind the hand. 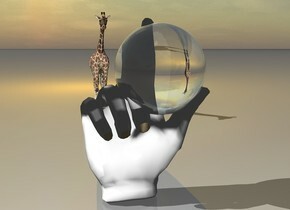 the tiny giraffe is 4 feet behind the hand. 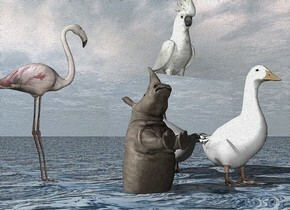 the large cockatoo is on the large silver cube. the ground is water. it is cloudy. the flamingo is a foot left of the cube. it is facing the cube. a large duck is in front of the cube. a tiny rhino is a foot left of the duck. it is in the ground. 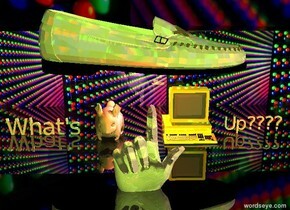 it is facing up.